This double bender is designed to speed up the bending process of rebar. The machine is faster than conventional table benders. 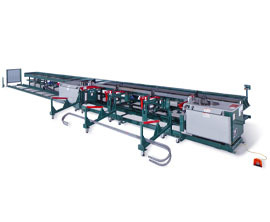 Compared to conventional table benders, the material handling and operation of the double bender saves labor by eliminating 2 and 3 man bending for long and heavy bars. When using the material handling arms, the rebar is loaded and discharged automatically. The machine's biggest advantage is the ease of bending large diameter bars and bars with multiple bends. There is less need for a highly skilled operator.